Nothing stays the same in SEO. Either a technique diminishes in effectiveness or it expands. These trends fluctuate due to the search engines trying their best to not only provide relevant results but also to outwit SEO experts. They don’t want anyone getting the high ground except themselves. This is the challenge of SEO. Experts battle now more than ever. The competition is fierce and the rivalries legendary. That being said, the upcoming future might bring in things that no one could expect. The first thing to do if you want to be prepared is get your basic site presence in order. Make sure your site is top notch mobile friendly. That should cover you for the present and to come. This way any surprises up ahead will be better to integrate. No one knows how and when keywords are going to go out of style, but the day is coming. Since so many SEO companies rely on keyword density as a marketing tool and work tool, the amount of attention they’ll be getting is unknown in the future. Keywords might just die off and some other parameter take their place. The big kicker is the direction of artificial intelligence aka A.I.. As computing continues to grow, so will AI. There may be AI systems on the horizon that boggle the mind. The industry websites try to keep up on SEO but even they find themselves at wits end when it comes to trying to fathom what the search engines are working on and will reveal to the public. Google has a suite of tools to help with SEO as do other sites. They want people to better adjust their pages for better indexing. As the AI improves, the ability of queries, no matter how grammatically incorrect, will bring about search engine results that the user can either find an answer or close to it. 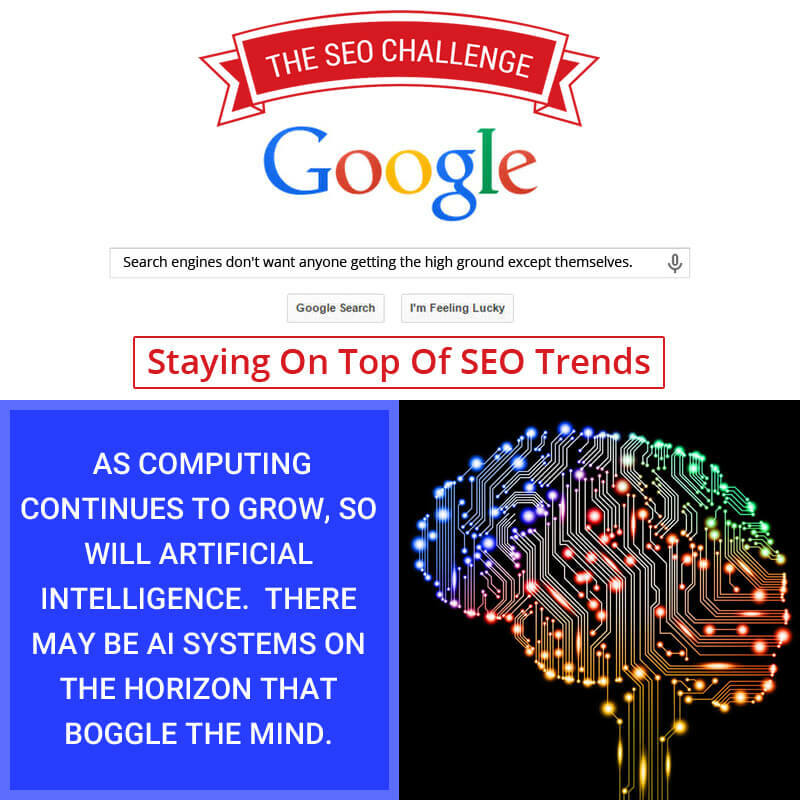 Search engines like Google have top AI software like their RankBrain. By the time SEO pros figure out what RankBrain really does it will be obsolete. SEO pros worry night and day that some new AI will get ahead of them and turn things totally in chaos. This is why one should always chat with the SEO pros to get their take on present issues. A real SEO pro will anticipate changes of both large and small scale. They’ll inform you of such strategies so as to keep you enlightened to what is going on. Hardware in computing will always change and services like voice searching will expand. People like voice search and soon your sites will have to be considerably optimized for such types of searches. The SEO pro will follow the guidelines that have come to light as Google rewards queries that can actually be answered by a site. Therefore your website has to answer a query with proper references and solid answers. From there, people will link to the answer or amazing product or service your site provides. Social media takes place now with people chatting and sharing and liking what’s on your site. SEO pros didn’t expect this and far too many focused on keywords, keyphrases, and keygroups. They soon found out they were on the wrong trail. So keep your ear to the ground regarding the future changes in SEO. It’s better to be awake at the wheel than stuck in the mud.